Heat a cup of whole milk. 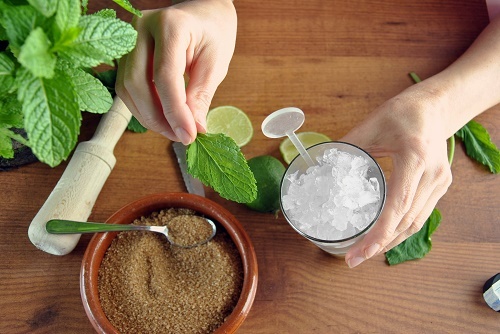 When it’s warmed up, add in ⅓ cup of coarsely ground coffee, ¼ cup of sugar and 20 crushed mint leaves. Whisk ½ cup of brown sugar and 6 egg yolks in a bowl, while adding some of the hot coffee-milk mixture. Pour it back into the pot with the coffee and milk and heat until it begins to thicken. Whisk a cup of the whipping cream into the mixture and add ⅓ cup of rum and ⅓ cup of chopped chocolate pieces. Freeze the mixture in cups and serve.